The sun rising at 06:13 am and setting at 07:38 pm. The moon, being 11% full, rising at 07:31 am and setting at 10:39 pm. The previous full moon was on Mar 31, 2018 while the next full moon would come on Apr 30, 2018. Mercury rising at 05:24 am and setting at 05:35 pm with a 24% of surface illuminated. Mercury would be orbiting the Sun at a distance of 0.46 astronomical units (AU) and would be found at a distance of 0.69 astronomical units (AU) from Earth. Given the planet elongation, the observer would see Mercury at an angle of -23° 31' 53.5" with the Sun. The brightness would be 1.2 this day, as measured by the planet magnitude. 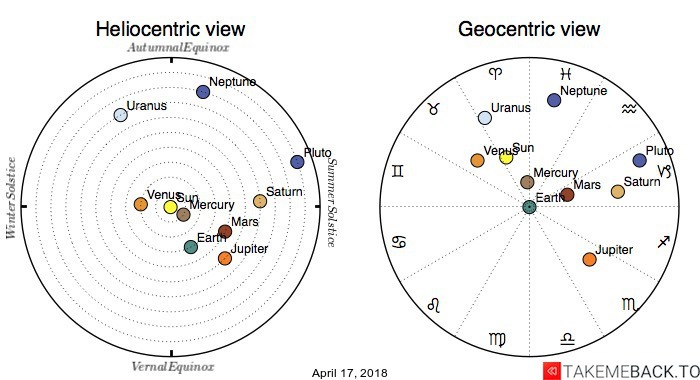 You can also see the map of the stars on Tuesday April 17, 2018 based on your location and at a specific time. Venus would rise at 07:18 am and set at 09:41 pm. 91% of Venus would be illuminated by the Sun. Venus distance from the Sun would be 0.72 astronomical units (AU) and its distance from the Earth 1.51 astronomical units (AU). The angular distance in the sky between Venus and the Sun would be 24° 11' 07.1". Mars would look like 87% full, orbiting the Sun at a distance of 1.51 AU and be at 0.95 AU from Earth. The planet would be seen rising at 01:48 am and setting at 11:01 am. The angular separation of the Sun and the planet, with Earth as the reference point, would be -101° 07' 49.0". The brightness of Mars, that is its magnitude, would be -0.09. Jupiter’s distance from the Sun would be 5.41 AU and 4.47 AU from Planet Earth. Jupiter rising and setting times would be 09:18 pm and 07:27 am respectively. Jupiter would appear with a 99% illuminated fraction of its surface and a magnitude (brightness of the star) of -2.31. Its angular separation between the Sun would be -157° 30' 51.1". Saturn would rise at 01:09 am and set at 10:29 am, appearing 99% full. The angular separation of Saturn from the Sun, as seen by the observer, would be -109° 21' 40.6", its magnitude 0.42. Saturn would orbit the Sun at a distance of 10.07 astronomical units (AU) and would be located at a distance of 9.69 astronomical units (AU) from Earth. Uranus would appear 99 full, its brightness being 5.9. It would be seen rising at 06:16 am and setting at 07:33 pm. Uranus would be 19.89 AU far from the Sun and 20.90 AU far from Planet Earth (average distance). The observer, looking up into the sky, would see Uranus with a -0° 38' 25.9" angle of separation from the Sun. Neptune rising at 04:37 am, and setting at 03:56 pm, its magnitude (the degree of brightness of a star) being 7.94. The difference between the celestial longitude of the Sun and that of Neptune would be -43° 12' 43.3". At 29.94 AU distance from the Sun and at 30.67 AU from Earth, 99 % of Neptune would be illuminated by the Sun. Pluto would be seen as 99% full and would have an elongation of -97° 16' 03.1". It would orbit the Sun at an average distance of 33.55 astronomical units (AU) and be located at an average distance of 33.40 astronomical units (AU) from Earth. The observer would see Pluto rising at 01:58 am and setting at 11:25 am, its magnitude (brightness of the star) being 14.31. Get a FREE Numerology report based on the digits of 17 April 2018! NB: The dimensions and the orbits of the planets are not in scale. The zodiac signs in the geocentric view are set assuming that Aries coincides with the vernal equinox and that each of the zodiac signs occupy exactly one-twelfth of the sky.